We’re so excited about Calling Glory’s new single, Carry Me, that’s currently being promoted to Christian radio stations across the country! This song has a great message reminding the listener that everyone has needed Jesus to carry them at some point in life. The story behind the song hit’s close to home for the band and they’re praying that the message encourages listeners across the country. We’ve been promoting this song to AC Christian radio and Soft AC INSPO Christian stations for two weeks and it looks like they are starting to listen in a big way! 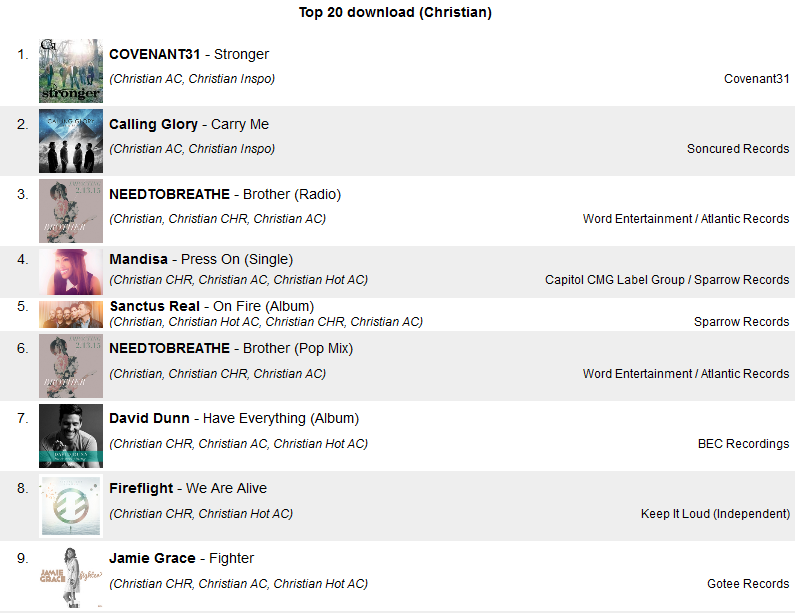 Last week Carry Me was the 2nd most Downloaded and Streamed song by Christian radio stations across the country. Please pray for the radio release and make sure to call, email, tweet and post on the Facebook page of your favorite Christian radio station requesting to hear Carry Me by Calling Glory! Soncured also has two other songs currently being promoted to Christian radio, so make sure to check them out; the songs are Cold Water by Tanner Clark and Separate Us by Josh Gilbert.